APS is committed to minimizing its carbon footprint (carbon based energy use) and emissions from its operations. Our emissions come from the energy used in our buildings and vehicle fleet. 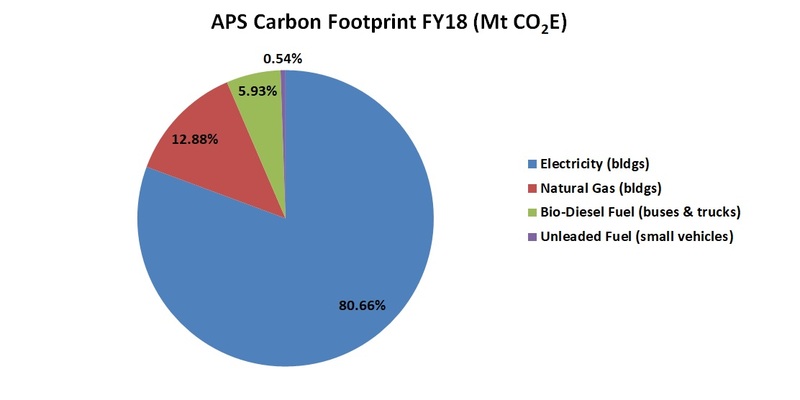 APS buildings use the greatest portion of all energy (94%), with electricity contributing the most to our carbon footprint. The pie-chart below provides a breakdown of our carbon footprint based on the types of energy used. We calculate carbon footprint in terms of metric tons of equivalent carbon dioxide emissions (Mt CO2E). There are two main ways for us to reduce our carbon footprint: using less energy and looking for renewable energy opportunities. APS strives to reduce energy consumption while ensuring occupant comfort through various ways – promoting energy conservation in the schools, optimizing building operations, improving energy efficiency during major renovations, and building more energy efficient new schools. APS is also exploring opportunities to provide incentives to the schools to create and implement their own energy management plans. Educational outreach regarding energy conservation through behavior changes and efficiency improvements will also be provided to the schools. Students that participate in programs that contribute to energy conservation are more likely to learn more about the topic and develop life-long conservation habits. Information on energy use and savings will be made available to the students and community to track and compare energy usage at both the school level and district wide. APS is also looking for ways to implement renewable energy sources in a fiscally responsible manner. Using renewable energy sources contributes to reducing our carbon footprint and provides an excellent educational opportunity for our students. APS’ renewable energy efforts include the major maintenance and repair of our geothermal heating/cooling system at Taylor Elementary School, purchasing renewable energy credits (REC) that total 5% of our overall energy use, and our new high school, Wakefield, which uses geothermal for heating and cooling, a 90 kW solar photovoltaic system and solar thermal for domestic hot water.